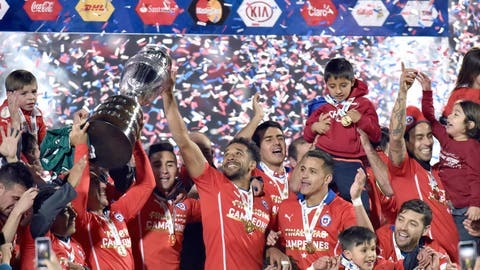 Chilean players celebrate after winning the 2015 Copa America football championship final against Argentina. Copa America winner Chile rises two places to No. 8 in the FIFA rankings still led by Argentina. Chile’s swap with No. 10 England is the only top-10 movement after no elite teams played last month. Ranking changes reflect matches played since 2011 reducing in value. Belgium edges World Cup winner Germany for the No. 2 slot. Colombia and Brazil remain in fourth and fifth. Wales are ninth and above neighbor England. Algeria leads African nations at No. 19. Mexico is CONCACAF’s best at No. 26, two ahead of the United States. No. 40 Iran leads Asia. The next rankings will take account of two rounds in European Championship qualifying matches and World Cup qualifiers in Asia and CONCACAF.